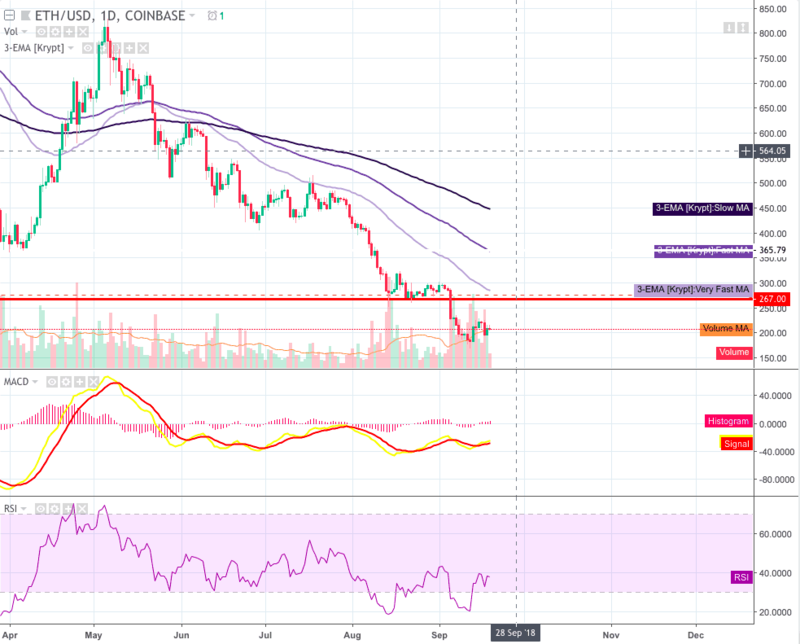 Home Technical Analysis Has Ether Price Reached the Bottom? Ether [ETH] technical analysis on 19th September 2018. Price is forming a higher low which may be a sign of the bottom. Other signs point towards upward movement, but caution should be exercised given the prolonged downturn for the price this year. Ether has been on a prolonged downward spiral during 2018. Price has dropped from above $1400 in January to lows of below $200. At the start of the year, many analysts would have deemed such a drop near impossible. Even at points where other cryptocurrencies and Bitcoin were recording appreciations, Ethereum continued its decline. However, we may be approaching the low for Ether as we are starting to see more bullish price action and also a higher low forming. Ether has returned to trade back above $200. The RSI is also forming higher highs and higher lows showing that more buying pressure is now on the market. The daily MACD has recently crossed its signal line to the upside and is converging towards the centerline showing momentum is starting to shift towards the buyers. A key point of resistance would be expected around $270. This is the point where price starting increasing exponentially back in November of 2017. This point acted as a significant support level on Ether’s downward move. On the hourly, we can see the price is currently trading around the point where the 50EMA, 100EMA, and 200EMA are trading. $200 will be acting as a level of support but with two recent breaks through it to the downside and to the upside afterward; it is unlikely to hold if sellers rush into the market. The outlook is currently neutral. Although the technicals are looking more bullish, traders should be cautious given the prolonged depreciations we have been seeing in Ether this year. Price is forming higher low on the daily. RSI on the daily also forming higher lows and higher highs. $270 expected to be significant resistance. $200 is the nearest support level but unlikely to hold if sellers rush into the market. Previous articleBitcoin Forming Higher Low After Steep Price Drop? Next articleHow Close Is Bitcoin to Passing Visa or Mastercard?